XOP Networks, Inc., a developer of premise based conference bridge platforms announces availability of integrated Desktop Video Conferencing with its Web Conferencing Application. Imagine a meeting room where people thousands of miles apart can see each other hear each other and share each other’s desktops. 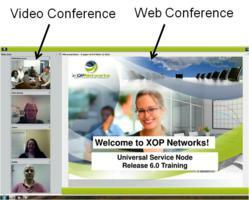 XOP Networks, Inc., a developer of Value Added Service (VAS) platforms and Audio Conference Bridges announces availability of integrated Desktop Video Conferencing with its Web Conferencing Application. XOP Networks' Digital Collaboration Bridge and Universal Services Node products have been supporting Audio and Web Conferencing applications for a number of years. These on-premise conference bridges can be deployed standalone or in conjunction with onsite TDM PBXs or IP PBXs. Low cost webcams and access to broadband speeds are now ubiquitous. This sets the stage for wider use of video conferencing at the individual desktop level. XOP Networks’ Desktop Video Conferencing application operates in conjunction with its Audio Conferencing, Web Conferencing and Instant Messaging applications, thereby enabling a multimedia conferencing experience for the end users. The Desktop Video Conferencing Application supports multiple head shots in a scalable video dock. A moderator can adjust the video resolution based on available bandwidth. The system supports all major models of webcams available on the market. “Imagine a meeting room where people thousands of miles apart can see each other hear each other, share each other’s desktops and IM with each other – that is the beauty of our multimedia conferencing application,” said Sudhir Gupta, CEO of XOP Networks. “For our Desktop Video Conferencing solution to work all one needs is PC with a webcam, connected to the Internet,” added Doug Jacobs, VP Marketing at XOP Networks.